10 years ago... A mysterious burst in the sky gave ordinary men and women extraordinary powers. They're called EPICS. But, every Epic turned out to be EVIL. Today, in the city once known as Chicago (now Newcago), an all-powerful Epic named STEELHEART reigns supreme! Your mission is simple, but not easy. Take down Steelheart and his Epics and SAVE THE CITY. Promos may be sold separately after Kickstarter. Deluxe KS promos included only for DELUXE and EPIC pledge levels. DELUXE and EPIC pledge levels will not be sold through retail, unless a retailer purchased via this Kickstarter. Limited copies may be sold at conventions or via our online shop while supplies last. 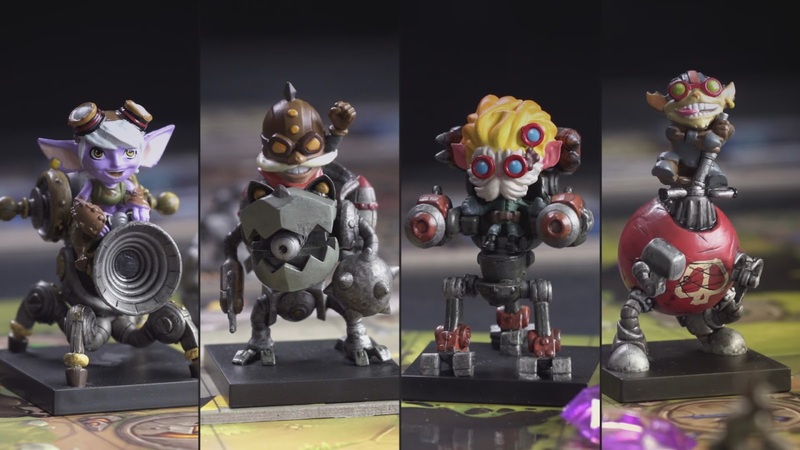 For the EPIC pledge level, the Player Miniatures and the PVC Steelheart Miniature will be pre-painted by PandaGM's studio - the same place that brought you the beautifully painted Mechs Vs. Minions miniatures. The Reckoners is a simultaneous, CO-OPERATIVE game for 1-6 players that plays in 75 minutes. During the game, you control one of the members of The Reckoners team. YOU WIN BY DEFEATING STEELHEART. But before you can defeat him, you must first discover his weakness. Steelheart Tray, Action Tracks, and Weakness Board. Note: The Power Tracks can be adjusted for difficulty. Seems simple, right? Did I mention that Steelheart and all his Epics have SUPERPOWERS? Each round, all of the Epics are going to activate, performing an array of actions and then powering up to be even more devastating next round. If the Epics manage to destroy Newcago by reducing the population to 0, then ALL RECKONERS LOSE. So, what are you going to do about it? At the start of the Reckoners turn, all players will SIMULTANEOUSLY ROLL THEIR DICE, selecting which results to keep until the next step. Each Reckoner starts with 6 dice (3 white and 3 matching their color). Each colored dice has a side with a double symbol on it, which naturally makes each Reckoner better at certain aspects of the game. Once all players have finished rolling, it's time to USE DICE TO TAKE ACTIONS. Once again, players simultaneously perform actions, and when all Reckoners have finished using their dice, then their turn is over. Researching and Attacking Epics will help you earn valuable rewards, including clues about Steelheart's weakness. But, there will always be more Epics than you, so you have to choose your battles wisely. You'll also want to acquire EQUIPMENT CARDS, which enable you to perform more actions each turn, manipulate your dice, and build a powerful engine to takedown Steelheart. Don't forget about PLAN TOKENS either! These can help you when the dice don't go your way and you need to get out of a jam. Purchase Equipment Cards to build your action engine and become powerful enough to takedown Steelheart. Your dice can also be used to contain epics, attack Enforcement, move around the game board, remove barricades, and activate special equipment powers. You can read more on full gameplay by downloading our rulebook. Rodney Smith from WatchItPlayed has agreed to teach the game on his YouTube channel, so keep an eye out for it later this year. The Reckoners was designed to be different every single time it's played. Yes, you will always face Steelheart in the base game, but his presence and abilities will vary greatly from game to game because they are derived from the Epics on the game board. Which Epics are out, the order they come out in, and how powerful they become will all affect Steelheart differently each game. Compound this with the variations of Equipment Cards, different Reckoners in the game, and combinations of die rolls, and now you've created a truly unique experience. We have nearly 100 unique illustrations in the game. A PDF of the Character and Epic artwork will be included with every pledge. Check out some sample cards below for a closer look at the incredible game art by Miguel Coimbra and Ian O'Toole. Lastly, it's hard to convey what the final dice actually look like in 3D renderings because they are made of transparent resin material. You can get a better idea from the photos below during our sampling process or view the BoardGameCorner video in the Reviews section. The Reckoners joins Zombicide Black Plague, Cry Havoc, and a few other select titles by earning the CORNER CERTIFIED AWARD from the BoardGameCorner, a member of the Dice Tower Network. This is an award for excellence for games, components, or accessories of exceptional quality and fun. Check out their Kickstarter Preview Video below. If you would like to see the entire live stream, check out the full game playthrough here. Note: All game components are in prototype form and subject to change (and improvement). Additionally, we've worked closely with Brandon's team and Dragonsteel Entertainment to ensure that the game is representative of the world mythos and enjoyable for fans of the series and gamers alike. Shipping costs are not included in your pledge and will be charged when shipping for The Reckoners begins. Nauvoo Games will be shipping via fulfillment partners in regions around the world as we've done for several campaigns in the past. This enables us to keep costs as low as possible. However, the reality is that shipping is very expensive, especially for a big box game with lots of components like The Reckoners. Charging a flat-rate for shipping can be unfair for the backer or the creator, and we want to avoid any surprises. For this reason, we will be using a Pledge Manager for this project, which allows us to more accurately charge shipping costs after the Kickstarter campaign ends. We will only charge shipping based on the weight and destination of your order. The above table lists estimated shipping costs by destination for one copy of The Reckoners board game after our subsidy. We understand the estimates are broad, so this may do little to help you budget. Therefore, once your shipping rate is determined in the Pledge Manager, we will give you the option to cancel your pledge for a full refund, minus any Kickstarter fees we incur, if you are unhappy with the amount. If you would like to order more than one copy, then you may do so after the campaign ends. The Pledge Manager will automatically calculate shipping costs for your pledge and any optional add-ons. Pledge for 1 copy of the BASE game. The amount will be subtracted from your total order later when games are ready to ship. Enter your information and desired quantities into this form. If you need to edit your responses, send us a message. And finally, a special thanks to Brandon Sanderson and all of the folks at Dragonsteel Entertainment and JABberwocky for making this project possible! We have successfully finished 3 Kickstarter projects and delivered each of them ahead of schedule. We've been around the block enough to know that there are often unexpected obstacles, and we promise to meet these challenges with strong work ethic and transparent communication. We are confident in the design of the game, as proven by almost 18 months of playtesting and reviewer feedback. However, the Reckoners is our biggest game yet with very challenging production requirements. We've been working with our manufacturer for multiple months already to generate samples and finalize all materials to ensure it has excellent quality production. But added stretch goals might take more time to complete. Please note that the final product might change slightly during the mass manufacturing process or get delayed. We are fully devoted to creating an amazing experience with The Reckoners, and we strive to give our backers excellent customer support throughout the process. We hope you will support our project with confidence and help make The Reckoners the best game possible. You are entitled to a full refund of your pledge within 14 days of the campaign's end, no questions asked. After that, we will refund 80% of your pledge up until 12 weeks before shipping (when the survey goes out). Once we've begun the survey process, NO refunds are possible. If for some reason a component is unable to be delivered, then we will refund that completely, including fees. Refunds within the 14 day window are reversed via Stripe directly to your credit card. After 14 days, we will provide refunds via PayPal up until the cut-off time. Any refunds processed will be in USD. By backing this project, you agree to log into your Kickstarter account and submit your project survey results, thereby providing us with your information (i.e. shipping address) to fulfill your pledge rewards, within 12 weeks of our survey notification. If you do not provide your information as indicated above within 12 weeks of our notification, you also agree that we have fulfilled our obligations to you in full for payment or donations received. We may, at our discretion, offer a refund or ship your pledge (at additional cost for international backers) if you complete your project survey after the 12-week window has elapsed. If you do not accept these terms, please do not pledge on this project and instead wait for the general release.